The first is the continuing war for talent. Consulting firms are constantly fighting to find new ways to attract, develop and retain the best people in the industry. While competition between consulting firms is not new, the consulting market also faces increased pressure from high-tech companies and start-ups targeting a limited pool of talent. The second is how to adapt to the rise of advanced robotics, artificial intelligence and machine learning. The opportunities for consulting firms presented by these technological advancements are huge – there are many traditional consulting activities that can be done quicker and better by machines – and such automation will also have a profound effect on the skills required of consultants in the coming years. The third is how to address the continued divergence of the consulting industry into two distinct markets. Namely, a high-volume market characterised by specialised knowledge, standardisation, verging on commoditisation; and a high-value, traditional ‘strategy’ consulting market where problems are often undefined and clients rely on the minds of consultants to help them make key decisions about their future strategic direction. We suspect many firms will already have their own strategy to face these complex and distinct challenges. We would argue, however, that a consulting firm’s approach to professional development should be a fundamental component of such a strategy, because, at their heart, each of these three challenges share a common thread: people. What type of training have you received at your consulting firm? What qualifications have you gained as part of your training? To win the war on talent, consulting firms need to find ways to attract, develop and retain the best people. A primary method for firms to drive desired employee engagement is through continued professional development and clear career paths. 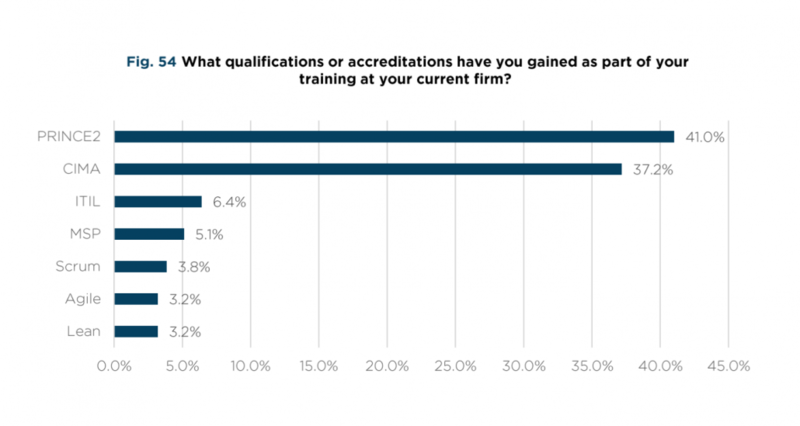 Indeed, in the MCA’s recent “Consulting Excellence Staff Survey,” when asked how their firms might improve their professional development activities, over 50% of consultants argued that the provision of clear career progression paths was most important to them. 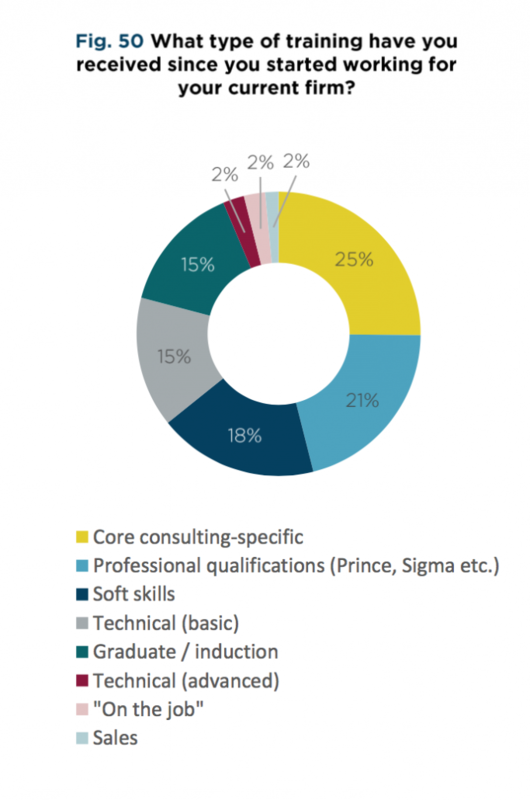 Furthermore, for the consulting industry to remain a destination of choice for a new generation of recruits, firms need to ensure their opportunities for professional development are second to none and may even reconsider if the traditional career path to ‘Partner’ has the same attraction to new recruits as was traditionally the case. There can be little doubt that technological advances such as robotics and artificial intelligence will lead to a fundamental shift in the types of skills and behaviours required in a consulting firm and some traditional consulting processes are ripe for automation – particularly data collection. In contrast, there are some functions of consulting that are less likely to be replaced by a machine. As more technical functions become automated, the premium placed on thinking and behavioural skills will increase. 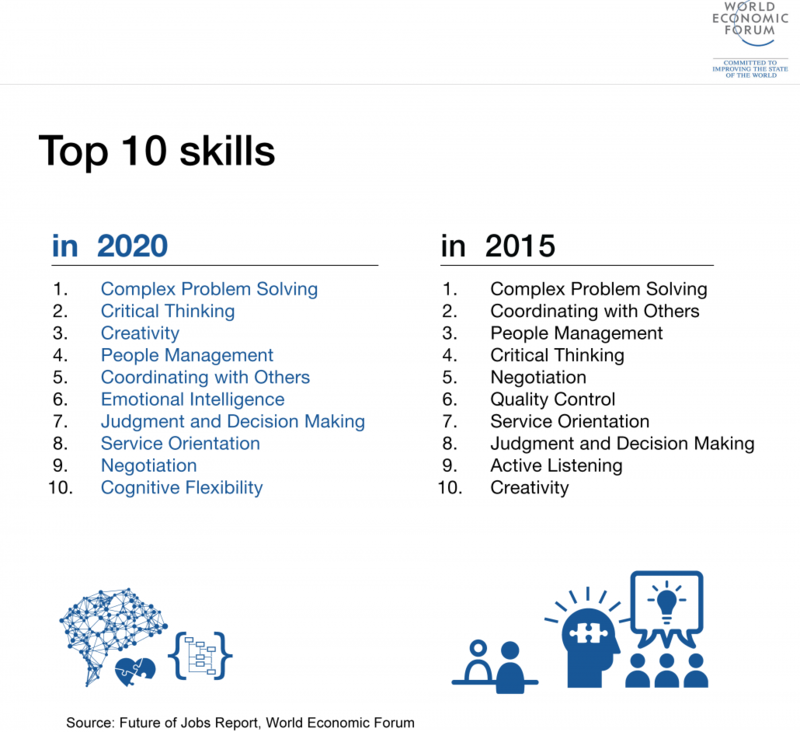 The diagram below shows the Top 10 skills that will be required in 2020 according to the World Economic Forum’s “The Future of Jobs” report. Contrast this to the diagrams above and it becomes apparent that the focus of professional development activities in many consulting firms needs to shift. When a market moves towards commoditisation, price often starts to become the differentiating factor. For most consulting firms, this isn’t a race to the bottom that they would really want to win. Yes, clients want technical expertise (such as digital expertise/cyber security). Yes, clients want functional expertise (such as supply chain experts) and yes, clients want sector expertise (retail, automotive) but as the market becomes commoditised, these features no longer differentiate firms. What really makes the difference to clients isn’t “what” but “how”. When it is hard for clients to distinguish between technical, functional and sector expertise, the real difference comes from the perceived value consultants will bring to the engagement. Clients often determine this value through interactions before and during the project. In most consulting engagements, value for the client stems from applying deep levels of expertise to complex scenarios to produce clear judgements and recommendations. Consultants who produce the most value for clients can think critically, solve complex problems, use cognitive flexibility, demonstrate creativity and carefully manage all communications and interactions. It follows then that a focus on behaviours – above simply technical skills – is vital to consulting firms succeeding in an increasingly commoditised market. Likewise, what differentiates firms at the high-value, classic strategy consulting end of the spectrum is not simply high levels of technical knowledge and experience – this is par for the course – but an ability to solve complex problems, think creatively and critically and to demonstrate added value in every single interaction with the client. It is the human, emotional and cognitive capabilities that deliver the extra value for the client and distinguish the firm. Leaders of consulting firms face challenges on many fronts. While technology is changing rapidly, so too are client needs. All the while competition between firms continues to rise, not only for client engagements but also to attract the best talent in the industry. How successful consulting firms are at facing these challenges will depend in great part on how they are able to manage, deploy and develop their people. The decisions firms take now regarding the development of their workforce will be a key factor in the performance and future direction of their consulting firm for years to come. The MCA’s renewed focus on professional development through the launch of their new Consulting Excellence Academy and the associated “Guide to Professional Development in Consulting Firms” could not be timelier. As an Associate Member of the MCA and co-authors of the “Guide to Professional Development in Consulting Firms”, we would be delighted to arrange a discussion with any MCA Member Firm to answer any questions they may have regarding the guide’s content and to discuss any perceived implications on their consulting firm’s professional development strategy. Simply complete this form and we will contact you directly. All of our programmes are delivered by experienced senior management level consultants who have each worked in top-tier consulting and professional services firms.